Our lovely friend Karen is selling one of her pair of vintage Dutch city bikes, to make room for her gorgeous new Linus loop-frame (which I hope she’ll review for us – its’ biggest selling feature for her was its ability to attach a Chariot for her little guy). shown with Karen at the Fall edition of Critical Lass. And so began our little game of Musical Bicycles. Eliza, via Fiona’s blog Retro Rides & Prairie Skies. which apparently mess with the installation of most styles of double kickstand available. She has 28 inch wheels, so I expect her to fit like Mary Poppins does. rectangular wicker basket and crocheted skirtguards. but as she works for her living, she has no patience for such pretentions. Nicki expressed interest in Eliza, but we knew Eliza was beyond her student budget. So I proposed that I might upgrade from Mary Poppins to Eliza – my budget can stretch this far, since Eliza is an everyday ride instead of purely a collector’s item, and I’m finding that 3-speeds are much better suited to my rolling neighborhood than single-speeds – and Mary Poppins would become Nicki’s new ride. Since we paid similar values for the two bikes, we could almost do it as a straight swap of Mary Poppins for Winnie, and not much actual cash needed to change hands, which made it very budget-friendly for Nicki. Mary Poppins does have a couple of repairs that need doing, but we think she’s closer to being everyday-ride-able than Winnie, and at lower cost (especially if DIY with EBC’s help is involved). Most importantly, Nicki has been nurturing a serious bike crush on Mary Poppins since she first laid eyes on her, and we know from the summertime edition of Critical Lass that she’s a perfect fit. This arrangement left me with both Winnie and Eliza, but the Musical Bikes fun won’t end there. Winnie needs attention for her nonfunctional coaster brake and a few other small issues, but she should be ready-to-ride with a couple more afternoons of DIY at EBC (a detailed list of her remaining issues is in the blog post about using her as my Basic Bike Maintenance learning bike). I’m hoping a new home for her will pop up in the meantime (if it’s with you, please let me know!). she’ll retain her jaunty custom basket liner and double kickstand. I know she’s going on to a great home. Update 1: Fiona has written about it too! More details on the Sparta, now named Sophi, in her post. It’s a 1935 ladies’ Rudge-Whitworth (not sure if it’s loop-frame or straight step-through), with cobalt-blue paint, and white celluloid-wrapped handlebars and (I think?) fenders & chainguard. It’s in fine condition and its current owner (the son of a collector) is looking for a home for it where it will be cherished as a completely unique piece of cycling history. A 1935 date puts this bike to either just before or just after Rudge-Whitworth were bought out by EMI (It’s not clear from the information available online how that ownership change altered the bicycles’ design & construction). What is clear is that after 1943, when Rudge-Whitworth were purchased by Raleigh, the bicycles became rebadged (but not second-tier) bicycles built using Raleigh’s proprietary parts, but with Rudge-pattern forks and chainring. The majority of the Rudge information online- has to do with post-1943 Rudge bicycles, or the groundbreaking Rudge motorcycles – so I have collected links to pre-Raleigh photos and information I have found online below. Alright, time to go discuss this like a responsible adult… wish me luck! 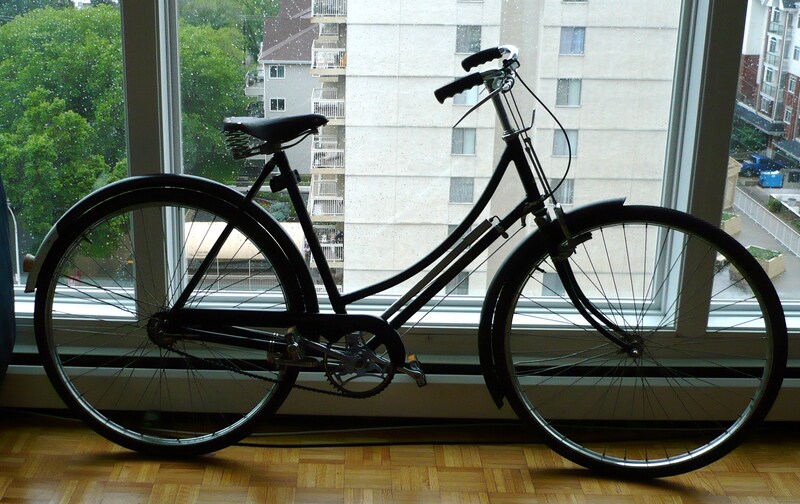 So… my dear bike-obsessed Edmonton friends… contact me if *you* are seriously interested and I’ll hand on the relevant information that’s not in this post. This may be a once-in-a-lifetime opportunity to own an antique bike of this vintage and distinction – since I currently can’t do it, I sincerely hope that one of you can. Dear new bicycle manufacturers: I know that vinyl decals and stamped aluminum headbadges are easy-to-apply, inexpensive, and shave a few grams off your bicycle’s weight, but today I’m perusing the Flikr Bicycle Head Badge group pool and longing for the days when every bicycle was deserving of carefully-designed cast brass with raised designs, beautiful fonts, and enameled details. Ludwig (similar to Henderson), and Regent. I LOVE the look of these old badges. Luckily some of the smaller bicycle manufacturers and handmade-bike designers (like Capricorn Bicycles, Rivendell, and Winter Bicycles) are still creating gorgeous headbadges. I also ran across Revolution Cycle Jewelry in my travels through Flikr – she is making custom headbadges using traditional metalworking techniques, of sterling silver, brass, and enamel. Beautiful work. There are also wonderful hand-sawn metal headbadges available from Etsy’s FutureCrash and Tangerine Treehouse (of Bike Moustache fame). It makes me want to break out some fine silver metal clay, brass metal clay, and enamel powder and see if I can create a sintered-metal OOAK headbadge for a special badgeless bicycle… which would require a special jig to factor in the shrinkage during firing, since the sintered silver isn’t malleable… hmmmmmm….